S/Sgt. Donal M. Johnson, son of Mr. and Mrs. R.E. Mitchell, graduated from Frederick High School. 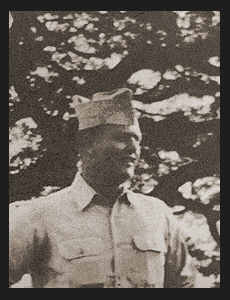 Entered Army in Oct., 1942, trained in Ft. Warren, Wyo. and Ft. Meade, Md. ; served in Trinidad, British West Indies and Puerto Rico; was charged in Nov., 1945. Awarded Meritorious Service Plaque.